A garage door is a complicated machine. It consists of many electrical and mechanical parts all working together, and there are a wide range of different issues that can develop. Circuit boards can fail, springs can break, rollers can corrode and sensors can be knocked out of alignment. Our technicians know how to handle all this and more, helping you prevent accidents and breakdowns. The most complicated part of your overhead door system is the opener. This unit is responsible for controlling the door's operation, as well as being the motor that provides it with the necessary horsepower. Because it’s so complex, it can develop all sorts of issues; wiring can be torn or knocked loose, sensors can get misaligned, circuit boards can fail and the opener’s trolley and rail can be worn out or damaged. Our team can identify and solve any of these problems and, if necessary, replace them; we work with manufacturers like LiftMaster, Genie and Chamberlain, and our experts will be happy to help you find the right unit for you. 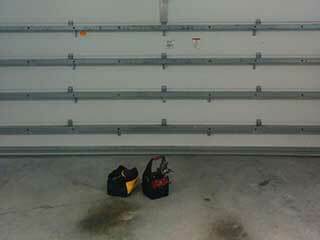 Garage door springs are responsible of supporting the full weight of the panels. They are therefore under enormous tension, and over time will grow weaker and wear out. A worn spring will eventually break, leaving your door unusable. Our technicians carry top quality replacement torsion and extension springs for all types of overhead doors, and can safely disconnect and replace any worn or broken units. It’s essential that you don’t try to perform spring replacement by yourself; these components can be very dangerous if not properly handled, so it’s best to call in our experts when something goes wrong with them. Door panels can get develop bents and dents more easily than you might think, especially if they are made of aluminum. Even a steel or wooden door can experience some issues, and if yours does, our team can take care of it. If your door has suffered more severe damage, we can also replace it completely with a new one from top-name brands like Clopay, Windsor and Amarr. Our team can solve any problem with your garage door, regardless of which part of the system is at fault. We provide fast, effective repairs that you can rely on. Contact Garage Door Repair Kingwood today for more information.